"After 48 Years, Unborn Victim of UT Tower Massacre Gets Headstone" was first published by The Texas Tribune, a nonprofit, nonpartisan media organization that informs Texans — and engages with them — about public policy, politics, government and statewide issues. Shortly before noon on Aug. 1, 1966, Charles Whitman, a 25-year-old former Marine, prepared to target his first victim from his perch on the iconic University of Texas at Austin tower. Claire Wilson, 18, who was eight months pregnant, and her boyfriend, Thomas Eckman, also 18, happened to be walking by. She survived, but the baby was pronounced dead on delivery at the start of what would be a hospital stay of more than three months for the mother, who is now Claire James. Eckman was killed by Whitman’s next shot. In all, Whitman killed 16 people, including his wife and mother before he went up to the Texas tower’s observation deck, where he was eventually killed by police officers. More than 30 people were injured. Relatives told James that her baby’s body had been buried, but James, now a resident of Texarkana, did not receive confirmation of that until almost five decades later. Lavergne discovered the baby’s burial site, and his family bought the headstone. “I try not to get involved in the lives of people I write about, but I couldn’t help it in this case,” he said. In addition to serving as the director of admissions research and policy analysis at the university, Lavergne has published four nonfiction books, three of which are true crime volumes. A Sniper in the Tower, published in 1997, was the first. In an interview last week, James recalled that she came across a copy of the book in November 1998 while at an airport and looked for her name in the index. While writing his book, Lavergne had given up on trying to find Claire Wilson. She had not lived in Texas for years. After dropping out of UT-Austin and ultimately graduating from Tarleton State University, she had spent most of her career as an educator moving around and teaching in one-room schoolhouses owned by the Seventh-day Adventists. “What you wrote was touching and true,” James told him in her email. They kept in touch and developed a friendship. In 2008, a reporter writing a profile of James asked Lavergne if he had discovered what had become of the baby’s remains. Lavergne had never considered the question. Later, after James made a similar inquiry, a desire to find the child’s whereabouts took root. “Off and on, when I had time, I made attempts, looking here, looking there,” he said. Lavergne has donated his archives to the Dolph Briscoe Center for American History at UT-Austin. In November 2013, he was preparing the materials from his most recent work, Before Brown, a history of Heman Marion Sweatt’s efforts to integrate the university beginning in the 1940s. Lavergne revisited a database of nearly 23,000 graves at Austin Memorial Park Cemetery, where Theophilus S. Painter, the university president of that era, is buried. Perusing the list of names, Lavergne came across an entry for a “Baby Boy Wilson.” The plot was leased to a Lyman Jones, who James confirmed had been her stepfather, removing any doubts as to the occupant’s identity. James accepted Lavergne’s offer to purchase the headstone, and said she was happy to use the name under which the child was listed in the cemetery records. “That seems pretty beautiful to me,” she said. Nearly 48 years after Charles Whitman's notorious shooting rampage on the University of Texas at Austin campus, his youngest victim — a baby still in utero — finally received a headstone this year. On campus, talk of the tragedy has been similarly muted. Keith Maitland, a filmmaker working on a documentary called Tower about the shooting, said several of his interns, who are UT-Austin students, were unaware of the 1966 shooting. Maitland said he mentioned this to a former university administrator who was pleased to hear it. University officials said there were no plans for any additions. Elizabeth Crook, whose novel Monday, Monday opens with a fictionalized depiction of the event, said many were still processing the tragedy. 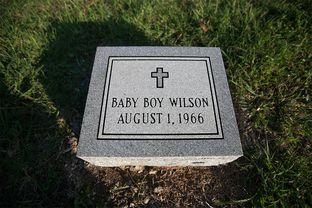 Lavergne said he hoped the headstone would, at least, help the world remember Baby Boy Wilson. James planned to travel to Austin this week to mark the anniversary of the shooting and visit his grave for the first time. Disclosure: The Dolph Briscoe Center and the University of Texas at Austin are corporate sponsors of The Texas Tribune. A complete list of Texas Tribune donors and sponsors can be viewed here. After 48 Years, Unborn Victim of UT Tower Massacre Gets Headstone By Reeve Hamilton August 1, 2014 Shortly before noon on Aug. 1, 1966, Charles Whitman, a 25-year-old former Marine, prepared to target his first victim from his perch on the iconic University of Texas at Austin tower. Claire Wilson, 18, who was eight months pregnant, and her boyfriend, Thomas Eckman, also 18, happened to be walking by. “From where Claire was standing, he could have shot her through the nose if he wanted to,” said Gary Lavergne, the author of A Sniper in the Tower, an account of the first mass shooting on an American university campus. “He was unmolested with a high-powered rifle. He put that bullet right where he wanted, and it was right through her belly.” She survived, but the baby was pronounced dead on delivery at the start of what would be a hospital stay of more than three months for the mother, who is now Claire James. Eckman was killed by Whitman’s next shot. In all, Whitman killed 16 people, including his wife and mother before he went up to the Texas tower’s observation deck, where he was eventually killed by police officers. More than 30 people were injured. Relatives told James that her baby’s body had been buried, but James, now a resident of Texarkana, did not receive confirmation of that until almost five decades later. 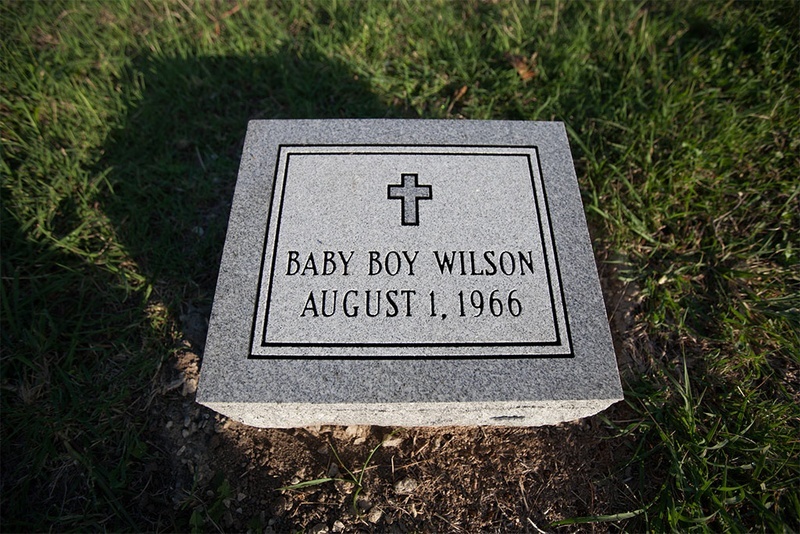 In June, in a section of Austin Memorial Park Cemetery where mostly infants are buried, a headstone was placed on a previously unmarked plot, acknowledging the final resting place of “Baby Boy Wilson.” Lavergne discovered the baby’s burial site, and his family bought the headstone. “I try not to get involved in the lives of people I write about, but I couldn’t help it in this case,” he said. In addition to serving as the director of admissions research and policy analysis at the university, Lavergne has published four nonfiction books, three of which are true crime volumes. A Sniper in the Tower, published in 1997, was the first. In an interview last week, James recalled that she came across a copy of the book in November 1998 while at an airport and looked for her name in the index. She then wrote an email for the first time in her life, telling Lavergne that, before reading the book, she had been “convinced that you wouldn’t have gotten it right, couldn’t have because you hadn’t talked to me.” While writing his book, Lavergne had given up on trying to find Claire Wilson. She had not lived in Texas for years. After dropping out of UT-Austin and ultimately graduating from Tarleton State University, she had spent most of her career as an educator moving around and teaching in one-room schoolhouses owned by the Seventh-day Adventists. To her surprise, James approved of Lavergne’s account, particularly the way he described her relationship with Eckman. In his book, Lavergne wrote that Whitman, by targeting such young couples, had “attacked love itself.” “What you wrote was touching and true,” James told him in her email. They kept in touch and developed a friendship. In 2008, a reporter writing a profile of James asked Lavergne if he had discovered what had become of the baby’s remains. Lavergne had never considered the question. Later, after James made a similar inquiry, a desire to find the child’s whereabouts took root. “Off and on, when I had time, I made attempts, looking here, looking there,” he said. Lavergne has donated his archives to the Dolph Briscoe Center for American History at UT-Austin. In November 2013, he was preparing the materials from his most recent work, Before Brown, a history of Heman Marion Sweatt’s efforts to integrate the university beginning in the 1940s. Lavergne revisited a database of nearly 23,000 graves at Austin Memorial Park Cemetery, where Theophilus S. Painter, the university president of that era, is buried. Perusing the list of names, Lavergne came across an entry for a “Baby Boy Wilson.” The plot was leased to a Lyman Jones, who James confirmed had been her stepfather, removing any doubts as to the occupant’s identity. “To know that the child was buried is very precious to me,” James said in the interview. “It means a lot more now than it would have back then.” James accepted Lavergne’s offer to purchase the headstone, and said she was happy to use the name under which the child was listed in the cemetery records. “That seems pretty beautiful to me,” she said. Enlargephoto by: Todd Wiseman Nearly 48 years after Charles Whitman's notorious shooting rampage on the University of Texas at Austin campus, his youngest victim — a baby still in utero — finally received a headstone this year. “I don’t think God needs something like a headstone to know where all the atoms and molecules are of a human being,” she said. “But it has always seemed to me that it was all unreal. Nobody talked about it, including my family. Nobody knew what to say.” On campus, talk of the tragedy has been similarly muted. Keith Maitland, a filmmaker working on a documentary called Tower about the shooting, said several of his interns, who are UT-Austin students, were unaware of the 1966 shooting. Maitland said he mentioned this to a former university administrator who was pleased to hear it. It was not until 1999 that a garden on the north side of the tower was dedicated to the victims. In 2003, a plan for a memorial was approved, but fundraising efforts were unsuccessful. In 2007, a bronze plaque was placed in the Tower Garden acknowledging it as “a memorial to those who died, to those who were wounded, and to the countless other victims who were immeasurably affected by the tragedy.” University officials said there were no plans for any additions. Elizabeth Crook, whose novel Monday, Monday opens with a fictionalized depiction of the event, said many were still processing the tragedy. “We don’t forget events like this. We keep wrestling with them,” the Austin writer said. “The university has had a difficult time figuring out how to remember and pay tribute to those who were killed without calling attention to the one who did the killing. How do we remember the one and forget the other?” Lavergne said he hoped the headstone would, at least, help the world remember Baby Boy Wilson. “Graveyards are not for the dead,” he said. “They are for the living. Maybe the argument would be that, after a while, people will forget you and no one will visit your grave. And maybe that’s true, but there’s something about a grave that makes you immortal.” James planned to travel to Austin this week to mark the anniversary of the shooting and visit his grave for the first time. When asked how she felt about it, James said, “It just feels full circle, you know?” Disclosure: The Dolph Briscoe Center and the University of Texas at Austin are corporate sponsors of The Texas Tribune. A complete list of Texas Tribune donors and sponsors can be viewed here. "After 48 Years, Unborn Victim of UT Tower Massacre Gets Headstone" was first published at by The Texas Tribune, a nonprofit, nonpartisan media organization that informs Texans — and engages with them — about public policy, politics, government and statewide issues. Link back to the original article, which is located at https://www.texastribune.org/2014/08/01/after-48-years-whitmans-unborn-victim-gets-headsto/.